Jackson Hole is the perfect destination for your Wyoming ski vacation, but this area is popular for other great outdoor activities. Why go snowshoeing? It’s fun, inexpensive and can be adapted for all experience levels and ages. What could be better than enjoying the beauty of the winter landscape at a slower pace? All you need are snowshoes, appropriate footwear and the right layers of clothing, and a most people would suggest a pair of poles. Whether you are a beginner or spend your weekends trekking on snowshoes, Jackson has the perfect trails waiting for you! If you would like a guide for your first time out or have experience but want someone to show you the area, Hole Hiking Experience is Jackson’s original nature company. They offer the Snowshoe Sampler (2 hour), The Explorer (½ day) or The Trekker (¾ day) snowshoeing hikes. Their guides are educated naturalists so not only will you enjoy snowshoeing, but you will also have someone to point out the wildlife and scenic landscape so you don’t miss all the Tetons have to offer. For a half day or full day tour of Grand Teton National Park, check out the online booking calendar for EcoTour Adventures. They have access to snowshoeing locations in the park that are flat, rolling, open or heavily forested. See their website for a description of energy level hikes including leisurely or moderately paced. You can also book a private tour that goes at a higher aerobic pace to go deeper into the backcountry. Comfortable setting out on your own? Check the JH Nordic website to do a trail search and find grooming reports. For snowshoe and equipment rental, visit Teton Backcountry Rentals. Does sliding and gliding along a trail seem like the perfect way to enjoy the scenic view? Cross-country skiing offers the chance to cover more distance and the area has several trails to choose from. Located just 10 minutes from town square in Jackson, Teton Pine Nordic Center provides 16 km of track groomed daily for a variety of cross country skiing techniques. They have a full service rental shop that will take care of your needs. If it’s your first time on cross-country skis and you want someone to guide you until you feel confident, the Nordic Center offers lessons from beginner to advanced. As expected in Wyoming, this area includes many ranches which open areas to cross-country skiing; Bar BC Historic Ranch, Triangle X Ranch, Turpin Meadow Ranch, and Whitegrass Ranch are just a few. Check information for each ranch for specific areas to park and approved trail area. Once again, check out the JH Nordic website for a full list of trails in the area including the length of each trail and features. Zoom in on the map for locations of over 80 trails along the Tetons. Descriptions include the terrain plus any fees for entry. 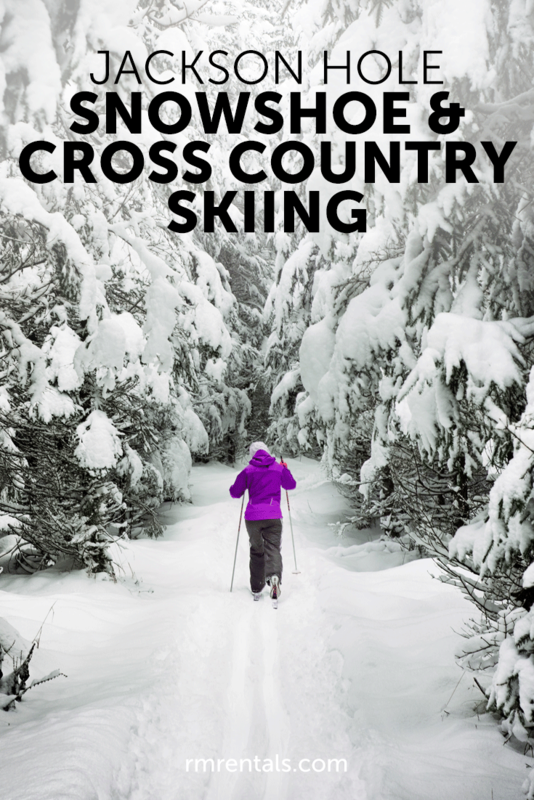 For cross-country ski rental, visit Skinny Skis, Jackson’s Nordic specialists. Have a great day snowshoeing or cross-country skiing and don’t forget your sunglasses, sunscreen, and water!